Mrs. Bernice I. 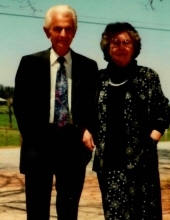 Woods Medlin, age 98 of Toccoa passed away Sunday, November 18, 2018 at Pruitt Health of Toccoa. A daughter of the late Walter and Julie Heaton Woods, she was born January 21, 1920 in Stephens County, Georgia where she lived all her life. She was a graduate of Toccoa High School. She retired from Coats and Clark and later enjoyed crafts and making flower arrangements. She was a member of Hill Street Baptist Church. In addition to her parents, she was preceded in death by her husband of 58 years, Grady Medlin who passed away in 1998, by two sisters, Christine Copeland and Geneva Thomas and by a brother, Dalton “Woody” Woods. She is survived by her children, Janet D. Walters and husband, Reverend Harold Walters of Anderson, South Carolina and Terry M. Medlin and wife Cheryl H. Medlin of Toccoa; six grandchildren; eight great-grandchildren; three great-great grandchildren and two great-great-great grandchildren; two brothers, Frank Woods of Easley, South Carolina and Billy Woods of Little Rock, Arkansas; and by a number of nieces and nephews. Funeral services will be Wednesday, November 21, 2018, 1 O’clock p.m. in the Hillcrest Chapel of the Acree-Davis Funeral Home with The Reverend Marc Walters and The Reverend Harold Walters officiating. The following gentlemen will serve as pallbearers, Jimmy Thomas, Duke Parker, Ken Walters, Tim Woods, Randy Crumbly and Archie Spires. The family will receive friends at the Acree-Davis Funeral Home on Wednesday, 11 O’clock a.m. until 12:45 p.m. Online condolences can be left for the family at www.acreedavisfh.com. Interment will follow in the Toccoa City Cemetery with the Acree-Davis Funeral Home in charge of the arrangements for Mrs. Bernice Medlin. To send flowers or a remembrance gift to the family of Bernice I. Woods Medlin, please visit our Tribute Store. "Email Address" would like to share the life celebration of Bernice I. Woods Medlin. Click on the "link" to go to share a favorite memory or leave a condolence message for the family.